The scientific name for the nurse shark sounds like something Bilbo Baggins might have said to summon elves to his rescue: Ginglymostoma cirratum . Actually the name is a mix of Greek and Latin and means "curled, hinged mouth" to describe this shark's somewhat puckered appearance. The origin of the name "nurse shark" is unclear. It may come from the sucking sound they make when hunting for prey in the sand, which vaguely resembles that of a nursing baby. Or it may derive from an archaic word, nusse, meaning cat shark. The most likely theory though is that the name comes from the Old English word for sea-floor shark: hurse. Nurse sharks are slow-moving bottom-dwellers and are, for the most part, harmless to humans. However, they can be huge—up to 14 feet (4.3 meters)—and have very strong jaws filled with thousands of tiny, serrated teeth, and will bite defensively if stepped on or bothered by divers who assume they’re docile. They use their strong jaws to crush and eat shellfish and even coral, but prefer to dine on fish, shrimp, and squid. They are gray-brown and have distinctive tail fins that can be up to one-fourth their total length. Unlike most other sharks, nurses are smooth to the touch. 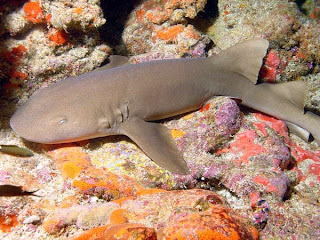 Nurse sharks are found in the warm, shallow waters of the western Atlantic and eastern Pacific oceans. They are abundant throughout their range and have no special conservation status, although the closeness of their habit to human activities is putting pressure on the species. Did you know? Nurse sharks are nocturnal, and will often rest on the sea floor during the day in groups of up to 40 sharks, sometimes piled on top of each other.